Oh Canada! Now How? 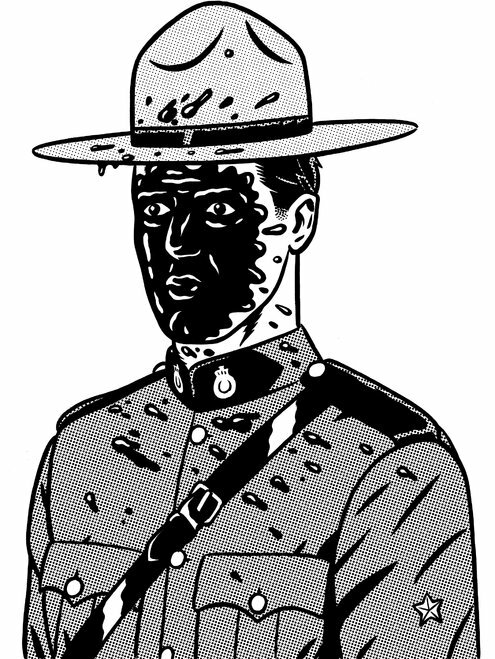 Is Canada Tarring Itself? Just forget the image of a pleasant liberal State – it has become a Conservative Oil State in boom! The Opinion Pages Op-Ed Contributor to The New York Times. Never mind, too, that the process that turns bitumen into consumable oil is very dirty, even by the oil industry’s standards. But say “tar sands” in Canada, and you’ll risk being labeled unpatriotic, radical, subversive. Performing language makeovers is perhaps the most innocuous indication of the Canadian government’s headlong embrace of the oil industry’s wishes. Soon after becoming prime minister in 2006, Stephen Harper declared Canada “an emerging energy superpower,” and nearly everything he’s done since has buttressed this ambition. Forget the idea of Canada as dull, responsible and environmentally minded: That is so 20th century. Now it’s a desperado, placing all its chips on a world-be-damned, climate-altering tar sands bet. Documents obtained by research institutions and environmental groups through freedom-of-information requests show a government bent on extracting as much tar sands oil as possible, as quickly as possible. From 2008 to 2012, oil industry representatives registered 2,733 communications with government officials, a number dwarfing those of other industries. The oil industry used these communications to recommend changes in legislation to facilitate tar sands and pipeline development. In the vast majority of instances, the government followed through. In the United States, the tar sands debate focuses on Keystone XL, the 1,200-mile pipeline that would link Alberta oil to the Gulf of Mexico. What is often overlooked is that Keystone XL is only one of 13 pipelines completed or proposed by the Harper government — they would extend for 10,000 miles, not just to the gulf, but to both the Atlantic and the Pacific Oceans. President Obama’s decision on Keystone XL, expected later this spring, is important not just because it will determine the pipeline’s fate, but because it will give momentum to one side or the other in the larger tar sands battle. Consequently, the Canadian government’s 2013-14 budget allocates nearly $22 million for pro-tar-sands promotional work outside Canada. It has used that money to buy ads and fund lobbyists in Washington and Europe, the latter as part of a continuing campaign against the European Union’s bitumen-discouraging Fuel Quality Directive. THE REDEEMING VALUE IN ALL OF THIS IS THAT CANADA HAS REDUCED THE IMPORTANCE OF THE MIDDLE EAST OIL STATES – BUT THEN WE MUST NOTE THAT SO FAR AS THE ENVIRONMENT IS CONCERNED CANADA IS NOW A MAJOR SINNER – NO LESS A SINNER THEN THE US FRACKING AFFECTIONADOS. THE TAR AND THE FRACKED METHANE HAVE HIGHER IMPACT ON CLIMATE CHANGE THEN PETROLEUM OIL. Beginning in 2006, Mr. Harper pledged to promulgate regulations to limit carbon emissions, but eight years later the regulations still have not been issued, and he recently hinted that they might not be introduced for another “couple of years.” Meanwhile, Canada became the only country to withdraw from the Kyoto Protocol. Instead, in 2009 it signed the nonbinding Copenhagen Accord, which calls for Canada to reduce greenhouse gas emissions to 17 percent beneath its 2005 level by 2020. According to the government’s own projections, it won’t even come close to that level. Climate change’s impact on Canada is already substantial. Across Canada’s western prairie provinces, an area larger than Alaska, mean temperatures have risen several degrees over the last 40 years, causing releases of greenhouse gases from melting permafrost and drying wetlands. The higher temperatures have led to the spread of the mountain pine beetle, which has consumed millions of trees. The trees, in turn, have become fodder for increasingly extensive forest fires, which release still more greenhouse gases. Given that scientists now think the Northern Hemisphere’s boreal forests retain far more carbon than tropical rain forests like the Amazon, these developments are ominous. At least the Harper government has indirectly acknowledged climate change in one way: It has made a show of defending the Northwest Passage, an increasingly ice-free Arctic Ocean link between the Atlantic and Pacific Oceans that winds through Canadian territory. Nevertheless, the Harper government has shown its disdain for scientists and environmental groups dealing with climate change and industrial pollution. The government has either drastically cut or entirely eliminated funding for many facilities conducting research in climate change and air and water pollution. It has placed tight restrictions on when its 23,000 scientists may speak publicly and has given power to some department managers to block publication of peer-reviewed research. It has closed or “consolidated” scientific libraries, sometimes thoughtlessly destroying invaluable collections in the process. And it has slashed funding for basic research, shifting allocations to applied research with potential payoffs for private companies. With a deft Orwellian touch, Canada’s national health agency even accused a doctor in Alberta, John O’Connor, of professional misconduct — raising “undue alarm” and promoting “a sense of mistrust” in government officials — after he reported in 2006 that an unusually high number of rare, apparently tar-sands-related cancers were showing up among residents of Fort Chipewyan, 150 miles downstream from the tar sands. A government review released in 2009 cautiously supported Dr. O’Connor’s claims, but officials have shown no interest in the residents’ health since then. Dr. O’Connor’s experience intimidated other doctors, according to Margaret Sears, a toxicologist hired by the quasi-independent Alberta Energy Regulator to study health impacts in another region near the tar sands operation. Dr. Sears reported that some doctors cited Dr. O’Connor’s case as a reason for declining to treat patients who suggested a link between their symptoms and tar sands emissions. The pressure on environmentalists has been even more intense. Two years ago Natural Resources Minister Joe Oliver (who this month became finance minister) declared that some environmentalists “use funding from foreign special interest groups to undermine Canada’s national economic interest” and “threaten to hijack our regulatory system to achieve their radical ideological agenda.” Canada’s National Energy Board, an ostensibly independent regulatory agency, coordinated with the nation’s intelligence service, police and oil companies to spy on environmentalists. And Canada’s tax-collecting agency recently introduced rigorous audits of at least seven prominent environmental groups, diverting the groups’ already strained resources from anti-tar-sands activities. Few Canadians advocate immediately shutting down the tar sands — indeed, any public figure espousing that idea risks political oblivion. The government could defuse much tar sands opposition simply by advocating a more measured approach to its development, using the proceeds to head the country away from fossil fuels and toward a low-carbon, renewables-based future. That, in fact, was the policy recommended by the National Round Table on the Environment and the Economy, a nonpartisan, eminently moderate independent research group founded by another right-leaning prime minister, Brian Mulroney, in 1988. The Harper government showed what it thought of the policy when it disbanded the Round Table last year. A version of this op-ed appears in print on March 31, 2014, on page A21 of the New York edition with the headline: Is Canada Tarring Itself?. The UK Guardian looks at TransCanada Keystone XL project that wants to bring Alberta’s Tarsands Crude to Texas refinery for exports of products to the World at large and says that the US Secretary of State is about to certify to the President that this is in the US National interest. Keystone XL Pipeline Closer to Reality After State Department Review. he Keystone XL, a mundane pipeline project that escalated into a bitter proxy war over climate change and North America’s energy future, moved one important step closer to reality on Friday. The State Department, in its final environmental review of the project, concluded that the pipeline, which would carry crude from the Alberta tar sands in Canada to refineries on the Texas Gulf coast, would not – on its own – have a “significant” effect on carbon pollution. The report acknowledged that crude from the tar sands was 17% more carbon intensive than conventional oil. But it said that did not mean that the project on its own would worsen climate change by expanding production from the tar sands. The finding clears the way for President Barack Obama to approve a project that has became a highly charged symbol of the fight over North America’s energy future. But he is under no deadline. The State Department said that the environmental impact statement it released on Friday was not an automatic guarantee Keystone XL would be completed. Eight government agencies and the public now have 90 days to weigh in on the project. Secretary of State John Kerry, who worked on climate change for years in the Senate, will also have a say. The final decision rests with Obama, who will determine whether Keystone XL is in the US national interest. But after five years of wrangling and delays, it now appears increasingly likely that TransCanada will be able to build the pipeline. Girling said it would take two full years to build the pipeline, once it had final approval. The State Department, in Friday’s report, essentially concluded that Keystone would have little material effect on greenhouse gas emissions and that Canada would continue to develop and ship tar sands crude with or without the pipeline. “Approval or denial of any one crude oil transport project, including the proposed project, is unlikely to significantly impact the rate of extraction in the oil sands or the continued demand for heavy crude at refineries in the United States,” the review said. The review included models suggesting that transporting oil by rail would generate even more greenhouse gas emissions than a pipeline, and also discussed measures to reduce greenhouse gas emissions from the pipeline. The finding came as a bitter disappointment to environmental groups and some Democratic members of Congress, who had urged Obama to reject the pipeline. “Even though the State Department continues to downplay clear evidence that the Keystone XL pipeline would lead to tar sands expansion and significantly worsen carbon pollution, it has, for the first time, acknowledged that the proposed project could accelerate climate change,” said Susan Casey-Lefkowitz, a campaigner for the Natural Resources Defence Council. The campaign against Keystone XL has become a national movement over the last three years, with environmental activists, Nebraska landowners and hedge fund managers all coming out against the project. In 2012, Obama, under pressure from landowners concerned about underground water sources and sensitive prairie, rejected the first proposed route for the pipeline across Nebraska. The White House continued to come under pressure from environmental campaigners. Former hedge fund manager Tom Steyer took out television ads on Tuesday, the night of Obama’s state of the union address, attacking Keystone XL, and other wealthy Democratic donors wrote open letters to the White House seeking to shut down the project. The pipeline would eventually double the amount of crude oil being shipped from Alberta’s tar sands. Campaign groups argued it would open up a vast store of carbon and tie North America more closely to a fossil fuel future. The climate scientist James Hansen said building Keystone XL would be “game over” for the planet. Industry groups and supporters said the project would help protect America’s energy supplies and provide jobs. Republicans in Congress – joined by some Democrats in conservative or oil-producing states – put forward legislation to compel Obama to move on the pipeline. They also warned that rejection of Keystone XL would damage relations with Canada, which has lobbied hard for the project. Canada’s prime minister, Stephen Harper, built his economic strategy around natural resource extraction – despite its toll on the climate. The Canadian government, in a report to the United Nations last September, estimated its carbon emissions will soar 38% by 2030, largely because of the development of the tar sands. Others argued that opponents had oversold the importance of Keystone XL as a contributor to future climate change. They said Obama’s commitment to cutting carbon pollution from power plants – the single biggest source of carbon dioxide emissions – would have a far greater impact on the climate. Obama said last June that he would base his decision on the project’s carbon pollution impacts. Some campaigners said they hoped Friday’s finding would still provide enough leeway for a refusal. But Obama has been consistent in trying to move on climate change while expanding fossil fuel development, much to the frustration of campaigners who say the two policies are incompatible. In his state of the union address, Obama gave strong support to natural gas development, but made no mention of Keystone. The State Department is awaiting a separate report from its inspector general, into allegations by environmental groups that a contractor’s review was biased because of connections to TransCanada and the oil industry. “It seems like it’s been very influenced by industry and that’s highly problematic,” said Scott Parkin, senior campaigner at Rainforest Action Network. Activists immediately called a series of protests against the decision. Nearly 80,000 people have signed up to commit civil disobedience to stop approval of the pipeline, said Elijah Zarlin, senior campaign manager at Credo. “If the State Department is recommending to the president that this is in the national interest, that would trigger action,” he said. 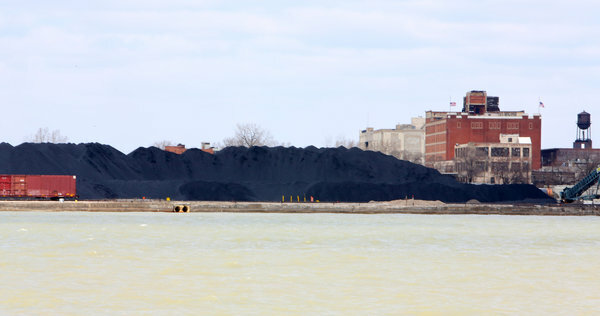 The Three Koch Brothers’ Coke – ‘The Detroit River becomes colateral to Canada tar sand oil extract. “What is really, really disturbing to me is how some companies treat the city of Detroit as a dumping ground,” said Rashida Tlaib, the Michigan state representative for that part of Detroit. “Nobody knew this was going to happen.” Almost 56 percent of Canada’s oil production is from the petroleum-soaked oil sands of northern Alberta, more than 2,000 miles north. 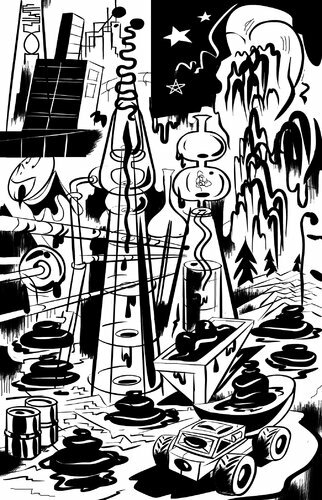 Cartoon #160 a reminder it is April “Energy Fools’ Day” by writing about Developing Tar Sands for Export – Destroying Alberta, Canada, and the US..
CANADA – COURTESY OF THE TAR SANDS INDUSTRY. Very Appropriate cartoon of the New York Times Cellebrating April Fools’ Day 2013. From the Canadian Centre for International Governance Innovation (CIGI) – the Balsillie School of International Affairs – we learn that President Obama would do a big favor to Canada by not allowing the Keystone XL pipeline. They say the Tar Sands Disaster Turns Canada Into a Third-World Petro-State. The Balsillie School of International Affairs (BSIA) is a centre for advanced research and teaching on global governance and international public policy, located in Waterloo, Ontario, Canada. The school is a collaborative partnership among Wilfrid Laurier University (WLU), the University of Waterloo (UW) and the Centre for International Governance Innovation (CIGI). The BSIA is housed in the north and west wings of the CIGI Campus building. The Centre for International Governance Innovation (CIGI) is an independent, non-partisan think tank on international governance, founded in 2005 as a not-for-profit institution on July 30, 2001. The organization was created through a $30-million endowment, including $20 million from Jim Balsillie and $10 million from Mike Lazaridis, co-CEOs of Waterloo-based telecommunications firm Research In Motion (BlackBerry). The founding followed an early-2001 retreat, convened by Balsillie, that brought together experts, academics and other thought leaders to determine how Canada could increase its capacity to contribute to effective multilateral global governance. CIGI – Originally named the New Economy Institute, the resulting think tank was renamed The Centre for International Governance Innovation in 2002 to clarify its focus and mission. In 2003, CIGI obtained a matching $30-million donation in federal funding, through the Department of Foreign Affairs and International Trade. In 2007, CIGI partnered with the University of Waterloo and Wilfrid Laurier University to launch the Balsillie School of International Affairs (BSIA). In 2009, CIGI announced plans for the new CIGI Campus in Waterloo. The campus houses CIGI and the BSIA. In time, the campus may also be home to other academic and research institutions, including a proposed CIGI program of research and studies in international law. The $69-million CIGI Campus received federal and provincial funding totalling $50 million through the Knowledge Infrastructure Program and Ontario’s 2009 budget. The City of Waterloo donated the land for the campus through a 99-year lease. Above tells us that the main goal of this institution is to do Canada good and to place Canada in a leadership position internationally. By 2010, CIGI was producing over 100 publications annually and employing more than 30 global governance experts across its research programs. Some projects had considerable impact — most notably, CIGI’s proposals for innovation in the G8 system helped lead to the creation of the G20 leaders group. Fareed Zakaria backs the Keystone pipeline and the production system in Canada that feeds it (we disagree) and he has a well thought out system that says – it is good for America at this stage. Fareed Zakaria, the anchor of the CNN/GPS Global Public Square Program – a journalist and much more – whose program we credited many times as the only program we recommend watching as a religious commitment to the tube, has a very clear view of the world. He knows that the dependence on Middle Eastern oil is at the base of all US problems – economical, social, and political – internal and external. From the gauging at the pump – to the political antics of the Brothers Koch. He knows that the world is changing and US attention must switch to Asia from Europe, and secure its backyard by finding more ways to cooperate with Latin America. To be able to do that, the US must start by cutting its umbilical cord to the Middle East. Yes, he knows this raises a lot of howls – from the Arabs who think they do a great favor to the US by selling their oil, and eventually from pro-Israel friends in the US that think Israel is still the baby that must be spoon fed rather then credited that it has matured and can be counted upon as a grown up ally. All this even before global warming/climate change is mentioned. So far so good – and this seems completely correct. But Fareed may tend to forget the advice scientists – his friends and my friends – give him. They say – keep away from all fossil fuels, not just the Arab oil – and develop an infrastructure that is based first on energy that was not spent – the cheapest way to enlarge the resource base – and then do everything possible to introduce renewable sources of energy that are long term sustainable. You will find – we say – that you do not have to wait for the long range, the so called externalities by the fossil fuels industry, when taken into account as expenditures, as they should be, assure us that the alternatives to burning oil and coal make already for sound economics in the medium range. This weekend Fareed Zakaria backed the Keystone pipeline and the Canada tar-sand oil extraction in Alberta – which will supply that pipeline – this without taking into consideration that this simply plays into the hands of the US oil industry but is a total NO-NO to the seekers for a true alternative. If the idea is simply jobs – it might be reasonable perhaps just to give money to the unemployed without causing the environmental destruction that goes with that pipeline and with the extraction of the Canadian oil. The moment he leaves the Keystone topic – Fareed returns to his best – the analysis of the evolving China, and of the new opportunities that opened up in Latin America with thr death of Hugo Chavez. Without Fidel Castro and Hugo Chavez, the US can attempt now a total reconfiguration of its strategy for its own hemisphere-base. Then, with its back more secure – it can extend a friendly hand to a changing China – a continental size, 1.3 billion people large State that is building with maximum speed the largest middle-class the world has ever seen. This new Chinese want quality of life and that they can achieve only by working in tandem with a secure United States. Everybody knows now that there is only one G-2 situation – disturbed now by the US in-fighting – but evident nevertheless to the incoming new Chinese leader. The days that China had a tremendous labor cost advantage over the US seem to be over, instead they feel water and energy shortages that they must handle in ordr not to slip from their path of growth. They do a lot to phase in renewable energy at a pace that is reasonable to them and would appreciate the breezing space that the US leaves behind when the US decreases imports of oil from Western Asia.Chavez as a devil figure but judges him in context of his country and the region and is able to see the positive aspects of Chavez having taken over leadership in a continent that US governments totally neglected and US business helped destroy. Each Latin country has its own US business excesses to tell about, as coincidentally Iran does. That does not mean that anyone North of the Border will have anything good to say about Chavez or Ahmadi-Nejad, but here we talk needed policy and not sentiments – and Fareed always was ahead of the Washington decision-makers in this non-technical areas. The U.S. Department of State released an extremely thorough report that tries to answer this question. It concludes, basically, that the oil derived from Canadian tar sands will be developed at about the same pace whether or not there is a pipeline. In other words, stopping Keystone might make us feel good, but it wouldn’t really do anything about climate change. Why? Well, given the need for oil in the U.S., Canadian producers would still get Alberta’s oil to the refineries on the Gulf of Mexico. There are other pipeline possibilities, but the most likely method of transfer is by train. The report estimates that it would take daily runs of 15 trains with about 100 tanker cars each to carry the amount planned by TransCanada…And remember, moving oil by train produces much higher emissions of CO2 (from diesel locomotives) than flowing it through a pipeline. On GPS Sunday: Debating Keystone, and what comes after Chavez? On GPS this week, should the Keystone pipeline be allowed to go ahead? Fareed presents his take on the proposed oil pipeline, and then invites a dissenter onto debate the issue: Sierra Club Executive Director Michael Brune. 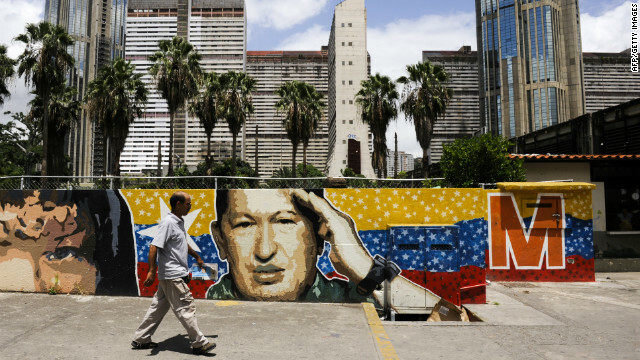 What does the future hold for Venezuela and the region with the passing of President Hugo Chávez? And what does it mean for U.S.-Venezuela relations? Fareed convenes a panel of thinkers including Moises Naim, a former minister of trade and industry in Venezuela, Rory Carroll, author of the new book Comandante, and Nikolas Kozloff, author of Hugo Chávez: Oil, Politics, and the Challenge to the United States. And, China’s new president: How Xi Jinping will manage the world’s most important relationship – that with the United States? Fareed speaks with China watcher Evan Osnos. Editor’s note: François Godement is a senior policy fellow and head of the China program at the European Council on Foreign Relations. The views expressed are his own. This week’s National People’s Congress will complete China’s once-in-a decade leadership change, with Xi Jinping becoming the country’s new head of state. China’s partners, and above all Americans, want a China that is a predictable and reliable. After all, huge business interests require stable relations with China. And there is no doubt, China is becoming more powerful – it is not only present in most parts of the world, but has also become a determining factor in the international arena. We would all therefore love to see Mr Xi as a Chinese Gorbachev. But getting to know Xi’s real personality, and his likely style of governing, feels like Kremlinology. And what is emerging is worrying. Xi is reputedly a charmer with an engaging and easygoing style. His wife is a famous singer, his daughter is quietly studying at Harvard. It is reported that he is even reluctant to embrace a luxurious lifestyle (although this does not appear to prevent some of his relatives from doing so). In public, Xi refrains from making controversial statements – an exception of course being the 2009 remark about the “full stomach” and the “constant finger pointing of Westerners” during a trip to Mexico. Right Now Calgary, Alberta, Canada, Celebrates 100 Years of a Major July Stampede – The Greatest Outdoor Show on Earth. Calgary /?kæl? ?ri/ is a city in the province of Alberta, Canada. It is located in the south of the province, in an area of foothills and prairie, approximately 80 km (50 mi) east of the front ranges of the Canadian Rockies. The city is located in the grassland and parkland natural regions of Alberta. Economic activity in Calgary is mostly centred on the petroleum industry and agriculture. Only in Calgary will you find the sights of sheep shearing, thundering chuckwagons racing, and roller coasters all happily co-existing just south of an equally bustling downtown skyline. For the last 100 years every July, Calgarians and out-of-town visitors have continuously kept the turnstiles spinning at the gates. From July 6th to 15th, this year’s Calgary Stampede is shaping up to be one for the ages as the city gears up to celebrate a century of founder Guy Weadick’s vision of the greatest outdoor show on Earth. Light up the City, presented by TransAlta: What’s better than a fireworks show at night? Five of them at the same time. On six nights, fireworks will be launched from each quadrant of the city plus the Stampede grounds and is being billed as the largest fireworks show ever displayed in Canada. 2012 TransAlta Grandstand Show, featuring Paul Brandt: Join Calgary’s own country crooner Paul Brandt for this year’s special Grandstand show. . Every night there will be song, dance, and spectacle in the form of a three-storey birthday cake that will launch fireworks into the sky. ENMAX Corral Show – TAILS: As part of your Stampede admission, stop by the Corral theatre and watch the story of three horses in a spiritual journey of kinship between humans and horses. The Midway: Don’t miss this year’s new ride offerings which include a 900 ft zipline and the first Stampede-branded Outlaw Roller Coaster. Just follow the blended screams of terror and joy emerging from grown men and women. Bell Centennial Plaza: Located in the heart of the Stampede Grounds, this new stage will host musicians, illusionists and acrobats throughout each day. Music: This year’s Coca Cola Stage will feature performances form acts such as Our Lady Peace, Big Sugar and Carly Rae Jepsen that are free with admission to the grounds. TheScotiabank Saddledome features The Beach Boys on July 11, Garth Brooks on July 12, Johnny Reid on July 13, New Kids on the Block and Backstreet Boys on July 13, and Brad Paisley on July 14. Stampede Breakfasts: Join the volunteer-run Stampede Caravan throughout the ten days for a breakfast to start your day. To find free flapjacks and meaty goodness, go to www.flapjackfinder.com orwww.freestampedepancakes.com. Also check out the Fluor Rope Square at Olympic Plaza for breakfasts and other events. Marching to the Stampede: It’s possible the best way to kick off a ten-day party is with the parade on July 6th. Leading the charge through downtown Calgary this year will be musician Ian Tyson. The parade begins 9 a.m. but getting there earlier will be key to finding a spot to actually watch the parade instead of people’s backsides. A small amount of advance seating is available. Party Tents: Across the city during the Stampede you can find tents constructed to accommodate more party-goers at bars and pubs such as Ranchmans, Cowboys and theWildhorse Saloon. More music: Keep your ears open for more artists playing outside the Stampede Grounds. Legendary rap artist Snoop Dogg will be performing at the Cowboys Stampede Tent on July 15. Fort Calgary will be hosting The Oxford Stomp featuring the Goo Goo Dolls, Theory of a Deadman and Big Wreck on July 13. Additionally, Fort Calgary will also hold the Stampede Roundup featuring 54-40, The Tragically Hip and Matthew Good. The Legendary Prairie Oyster Bonanza: Amongst Bottlescrew Bill’s largest Calgary selection of beers is their 19th annual Testicle Festival serving up the oval-shaped nether-regions of calves in dishes such as fritters or the more aptly-named bacon-wrapped “tendergroin.” Ballsy indeed. The First Calgary Stampede: For history buffs and folks looking for something a little quieter, the Glenbow Museum is exhibiting the works of Charlie Russell who exhibited at the first in 1912. Don’t miss this rare and exciting opportunity to see the works from the original exhibition that have been culled from public and private collections around the North America. The Keystone XL Tar Sands Pipeline will Send the Oil to China, Permanent Jobs to Canada, and leave the Oil Spills in the US. It will also Get the World to be Warmer and Extend Global Dependence on Oil. Some ask President Obama – JUST SAY A SHORT NO! The President and Republican House Speaker John Boehner preferred to see in this a political wrestling game to be continued for election politics purpose. The Oil Goes to China, the Permanent Jobs Go to Canada, We Get the Spills, and the World Gets Warmer. You’ll hear the GOP, the American Petroleum Institute, and the U.S. Chamber of Commerce make wild claims about the job creation potential of the Keystone XL tar sands pipeline. Don’t be fooled. The pipeline company itself admits only “a few hundred permanent jobs” are created by Keystone XL. The debate over whether Keystone XL creates jobs is a convenient diversion from something oil company backers don’t want you to know: this is an export pipeline to help them access foreign markets and bypass the United States. Oil companies will make bigger profits and oil prices for Americans will increase. That’s not a project that helps Americans. It’s a project that helps Big Oil. The oil industry is pulling a bait and switch scam with Keystone XL – offering it as a path to economic and national security when the pipeline is mostly meant for export. According to the State Department, only 20 permanent jobs will be created by the pipeline. Even the pipeline company acknowledged that only “a few hundred permanent jobs’ will be created. Claims the pipeline will created 100,000 jobs are false. The U.S. State Department estimates no more than 6,000 temporary construction jobs will be created over the two years. We need better from Republicans when it comes to a jobs plan than a single project with jobs that won’t last. While the debate over job creation from Keystone XL has attracted a lot of attention, long-term real job creation on which Americans depend is occurring in the clean energy industry. In just a six week period in September and October 2011,Environmental Entreprenuers, a national community of over 850 individual business leaders, identified the creation of 32,000 clean energy jobs by 100 companies including manufacturing plants, power generation project, renewable energy, and energy-efficiency retrofits. More than 2.7 million people are working in the U.S. clean energy economy right now – more than the entire fossil fuel industry put together. Every month new clean energy jobs are announced that are shovel-ready and lead to long-lasting permanent job growth in America. Clean car manufacturers have created over 151,000 quality long term jobs in the United States while saving consumers billions of dollars at the pump. Between 2003 and 2010, the clean energy sector grew nearly twice as fast as the overall economy. If we are going to truly debate national job creation, we should be working on measures that will create jobs on a national scale while achieving true energy independence for our country. And we’ve already made tremendous strides on that front. This pipeline would move dirty oil from Canada to refineries in Texas and would set back our renewable energy efforts for at least two decades, much to our enemies’ delight. It would ensure we maintain our oil addiction and delay making the tough decisions regarding energy production, management and conservation that we need to start making today. The laser-focus emphasis on Keystone XL by House Republicans, the U.S. Chamber of Commerce and others is nothing short of politics. They are conveniently avoiding a more important point about how the Keystone XL pipeline that provides tar sands oil companies a platform to export oil while making billions of dollars in profit. Instead, the pipeline will take the dirtiest oil on the planet, put America’s heartland at risk, and then send that oil to the highest bidder around the world. Building pipelines to the Gulf Coast, in addition to providing oil companies an avenue to export, also increases oil prices. There is concrete evidence (pp. 27-28) that building Keystone XL will increase oil prices in the Gulf Coast Market and the Midwest. In the end, real job creation won’t come from approving a foreign pipeline. The evidence shows the future of job creation is in global clean energy markets. And that the real purpose of this pipeline is to give tar sands producers access to international markets. Danielle Droitsch is director of Natural Resources Defense Council Canada. This piece was originally published at the NRDC Switchboard blog. The Obama administration rejected a bid to expand the Keystone XL oil sands pipeline. UPDATED: NEW DATE – January 24, 2012, the day AFTER Congress returns to Washington, www.350.org intends an action in Washington DC to point out that Big Oil money is behind votes in Congress. The immediate issue is the Keystone Pipeline for tar-sands oil to Texas refineries..
Time to Blow the Whistle on Big Oil Corruption. Hate to do this, but the holidays are well and truly over and I fear that if we want to stop the Keystone pipeline, not to mention climate change, we’ve got to get back to work. January 23—a week from Monday, gulp—is the date we need you to circle, especially if you’re somewhere along the East Coast. Here’s the story–things in Washington are getting weird. We don’t have super-secret inside information, but as far as we can tell the administration is still committed to calling Big Oil’s bluff—we think they’ll deny the permit for Keystone sometime before the February 21 deadline. But that seems only to have enraged the fossil fuel industry.The head of the American Petroleum Institute promised ‘huge electoral consequences’ if Obama denies the permits; meanwhile, the fossil fuel harem on Capitol Hill is planning to introduce legislation that would take away the president’s right to make the decision and simply grant the permit themselves. We need to be outraged—if this is what business as usual looks like, then business as usual isn’t acceptable and has to stop before the planet cooks. No one would countenance this kind of corruption at a high school gymnastics meet—it’s simply not right to take money from a company and then vote on its interests. Here’s the plan: Instead of circling the White House, this time we’re going to show up at Congress. And we’re going to do it in…referee’s uniforms. On January 23, the day they return to business, we’ll be there at 3 in the afternoon, ready to blow the whistle on their corruption. The demonstration will start on Capitol hill, and then we will head to the headquarters of the American Petroleum Institute, the oil industry’s #1 lobby. We’re going to call penalties—forget facemasking, this is vote-buying. Forget unsportsmanlike conduct—this is undemocratic conduct. This time we plan to get up close and personal with some of the worst folks on Capitol Hill – it won’t work right away. These guys have been having their way for so long that it won’t dawn on them quickly that the game is us. We’ll have to fight them all spring long to prevent Keystone, and to take away the billions in subsidies that they present each year to the oil industry (with our money). But if we’re going to take back our country we’ve got to start somewhere, and January 23 is the day. Environmentalists, and people that see an economy not based on fossil fuels, ask President Obama to look at alternatives to the Keystone XL pipeline planned for the transport to Texas refineries of the Canadian Tar-Sands extracted oil. The President was elected also in order to promote the switch to American Renewable Sources of Energy and to see to it they are achieved thanks to the creation of new Job Positions in America. On Dec. 15, I provided to Bill McKibben, author and founder of 350.org, several considerations for opposing the infamous tar sands pipeline. It is right now being forced down our throats if President Obama does not veto a spending bill. At the bottom of this recommendation, we provide an activist alert to fight the Senate’s and the White House’s tendency to compromise at the expense of the public’s and nature’s health.In addition to well-known environmental objections to the Keystone XL Pipeline — offered to counter the “jobs” and “lessen foreign oil” arguments by the Republican-controlled House of Representatives — we recommend a long-term approach. I’m wondering what journalistic-activist response there will be right away to the tar sands pipeline gambit that the Republican House has sprung as part of the jobs and benefits legislation hitting Obama. I know Bill McKibben’s working on something, as he and I talked today about the “jobs” and “foreign oil” issues that the Republicans are trying to seize on.Below is the gist of what I gave McKibben, as I told him “in no particular order.” He liked all the points I gave. You’re welcome to use my points as a sidebar for an article. foreign oil and domestic oil are fungible, and the entire oil industry, from a New York trader to an OPEC gov’t, are in one fraternity of trade on a daily basis. the fossil fuels-based economic establishment is beginning to die, so tar sands are a desperate attempt to maintain a strategic hold on the world. Boehner and others figure that if the Keystone doesn’t run into the U.S. then a pipeline will get the stuff to BC and then to China. And the National Security State needs another bogeyman for the public to fear: China. debt-for-nature swap between China and the U.S.: China owns massive U.S. debt, and can “collect” on it harmlessly while transforming the American lifestyle of energy waste: The U.S. would implement energy conservation and renewable energy measures that involve everything from policy change to individual incentives. (A local, city-council resolution campaign is being designed.) The carbon credit is given by the U.S. to China, in exchange for debt reduction, and China gets carbon-emissions reduction credit for the next Kyoto agreement. The U.S.-China treaty thus defuses saber rattling in the Pacific. Please see How China and America can work together to solve climate crisis. Container ships slow down to speed of old clipper sailing shipsOne hope I have is that in future when Congress or NPR hear from some “oil analyst,” such a person is not always in the pay of Big Oil or so aligned. I met some more Congressmen in November so maybe I can someday testify and open up other issues than the usual consumer-economy ones! URGENT: STOP SENATORS FROM CAVING ON KEYSTONE XL!Send an urgent message telling your Senators “Absolutely NOT!” before it’s too late. Go to the website to register your opposition. US Big Oil and the Government of Canada want to export the Alberta Tar-Sands’ Bituminous Oil via new pipelines and make a lot of money. Environmentalists all-over the globe ask President Obama to withhold his OK to these projects. He has the legal right to do so – will he considering the present politics? Will he consider the financial losses to the public from Climate Change? President Obama Challenged to Stand Up to Big Oil Lobby. UXBRIDGE, Canada, Aug 31, 2011 (IPS) – The United States’ biggest environmental groups put aside their differences last week to make an urgent intervention on the country’s addiction to oil. The first step on the long road to recovery, they say, is to stop the proposed construction of the Keystone XL pipeline that will “mainline” the world’s dirtiest oil from northern Canada into the U.S. heartland. The green groups asked the president to be strong and take the first step by denying permission to build the 2,400-kilometre, seven- billion-dollar pipeline, which would pump 700,000 to 800,000 barrels a day of bitumen oil from Canada’s tar sands in northern Alberta. Thousands of people have brought the same message to President Obama’s front door at the White House in the past 10 days. More than 500 have been arrested for protesting on the White House sidewalk, urging him to take the first step in breaking the country’s addiction to fossil fuels by standing up to the Big Oil lobby. This is an unusual circumstance, where the president gets to make the “go, no go” decision all by himself. No need to deal with a dysfunctional Congress. And environmentalists argue that for a president whose popularity has plummeted, it would seem to be a public relations coup to take a stand and finally act on his promises to fight climate change. The problem for President Obama is that some of the world’s most powerful oil companies have a problem. Big Oil has made enormous investments in Canada’s tar sands, the second largest oil reserves on the planet. They need to ship their “product” – and lots of it – to the lucrative U.S. market for processing, and very likely export it to Europe or even China. TransCanada Pipelines is eager to build the Keystone XL to transport its “product” across the border. The company will charge hundreds of millions a year for the service, but it’s worth it because Big Oil will use the pipeline to make an estimated 40 to 60 billion dollars a year, or maybe more, depending on how high they can jack up the street price of gasoline. Big Oil has worked hard to ensure the full cooperation and assistance of the government of Canada and the province of Alberta, where the tar sands are located. For a piece of the action, the governments of Canada and Alberta have been slow or failed to enforce their own environmental laws. Canada has completely ignored its international obligations to reduce fossil fuel use. Both governments have used public funds to furiously lobby their counterparts in the U.S. to follow suit. It was hardly surprising then to see a letter by Canada’s ambassador to the U.S., Gary Doer, published Monday in the New York Times using arguments promoting the Keystone project that appear to be lifted from TransCanada’s press releases. The U.S. and Canada clearly have an oil addiction, but green groups argue that it is oil money that keeps them addicted – and keeps them from getting into rehab. During the last election cycle, the oil industry gave members of the U.S. Congress more than 13.6 million dollars, reports Steve Kretzman of Oil Change International, an NGO that researches the links between oil, gas, coal corporations and governments. These pay-offs are excellent investments. Top U.S. oil companies reported 73 billion dollars in profits in just the first six months of this year. Part of those profits is thanks to at least four billion dollars in annual subsidies from U.S. taxpayers, noted Kretzman in a recent report. Despite the U.S.’s ballooning debt crisis, Big Oil will continue to receive this public money in what is by far the country’s biggest welfare fraud. Eight of the 12 members of the newly-named Joint Committee on Deficit Reduction charged with tackling the debt crisis have voted in the last two years to allow oil companies to keep pocketing billions in taxpayer subsidies, Kretzman found. Remarkably, Canada’s corporate welfare for Big Oil is far higher at 2.84 billion dollars in 2008 according to International Institute for Sustainable Development (IISD) based in Winnipeg, Canada. Last month one of the world’s richest corporations, Shell Oil agreed to accept a ‘gift’ of 865 million in Canadian taxpayer’s dollars to cover most of the cost of building an experimental carbon capture and storage (CCS) facility to cut its CO2 pollution in the tar sands. Study after study show that public subsidies for alternative energy – not including corn ethanol – which would actually wean the U.S. and Canada of their oil addiction are a small fraction of what the oil industry get. Which begs the question: If the U.S. and Canada are really trying to kick their oil addiction, why do they keep giving their dealers bonuses? Unless the river of money flowing into Big Oil’s coffers from subsidies and the biggest corporate profits in history are diverted, scientists and activists say there is no hope of dealing with climate change, the biggest crisis humanity has ever faced. NORWAY, When It Comes To The World Is Of Two Minds: THE GOOD AND THE BUSINESS OF OIL as Spearheaded by STATOIL. Dr. James Hansen gets the Oslo Sophie Prize and has a public extra exchange of open letters – originally addressed to Prime Minister Jens Stoltenberg about participation in Canada’s Tar Sands projects. As you know, I am fond of Norway, and have great respect for your country and its citizens, as well as for your personal ambitions to protect global climate. Your recent rainforest initiative is a splendid example of leadership the world desperately needs. And your commitment at the Copenhagen climate talks to reduce Norway’s emissions 40 per cent by 2020 was exemplary. However, and especially in light of that, I am disappointed to learn that Statoil, Norway’s state-owned oil company, has taken such backward strides through its strategic decision to invest in Canada’s destructive tar sands industry. As the most energy-intensive source of oil, this project represents the worst of what humans are doing to the planet in a quest to prolong our global addiction to fossil fuels. It is still feasible to stabilize the climate, but only if we leave the tar sands in the ground. The massive greenhouse gas amounts from the tar sands surely would cause the climate system to pass tipping points, while also trampling on the human rights of Canada’s First Nation communities and greatly damaging the Canadian boreal forest. Prime Minister Stoltenberg, the world has reached a critical juncture in the climate debate. We can either move into the production of the most damaging fossil fuel, or we can begin to address our destructive addiction. We desperately need leadership at this time. I am confident that you could provide that leadership. Please do not prove me wrong. In your capacity as owner or more than two-thirds of the shares in Statoil, I urge you to end Norway’s involvement in this dangerous, dirty and destructive project. I ask that you support the resolution at Statoil’s upcoming AGM on May 19th, that Statoil show environmental leadership and pull out of the Canadian tar sands. Statoil may pride itself on being a more responsible company than others, but that will not be enough in the tar sands. If we extract and use the tar sands, there can be no sustainable future for young people. James E. Hansen is member of the National Academy of Sciences, an adjunct professor in the Department of Earth and Environmental Sciences at Columbia University and at Columbia’s Earth Institute, grandfather and winner of the Sophie Prize 2010. James E. Hansen will visit Norway June 22 and 23 2010 to receive the Sophie Prize. Thank you very much for your e-mail to the Prime Minister, which was forwarded to the Ministry of Petroleum and Energy as the governmental body responsible for Statoil ownership issues. Let me first take this opportunity to congratulate you on being awarded the Sophie-prize for 2010. I know a lot of people are looking forward to your visit to Norway, and I hope you will enjoy your stay here. On behalf of the Government, I am pleased to say that we hold your work on climate change in high esteem, and further, that we appreciate your engagement and your views on Norway’s efforts to find good sustainable solutions to the global climate challenges. As you now know from the results of the Statoil Annual General Meeting, we see Statoil’s oils sands investment as a commercial decision which is within the Statoil board’s area of responsibility. We are of the opinion that such decisions should not be overturned by the AGM. It is our opinion that this is in line with good corporate governance, a view that is also shared by a vast majority in the Norwegian Parliament. I can however assure you that we will continue our offensive stance on climate change issues both at home and abroad, and we look forward to your continued engagement. I understand that you may have missed my open letter to you published in Aftenposten, so for your convenience I have attached it here. My wife Anniek and I are looking forward to visiting your beautiful country in June. AND THE – Message from Sophie Prize Winner. I am grateful to Jostein Gaarder and the Sophie Foundation for the opportunity to discuss the state of Earth’s climate, the implications for people and nature, and action that is needed. Our planet today is close to climate tipping points. Ice is melting in the Arctic, on Greenland and Antarctica, and on mountain glaciers worldwide. Many species are stressed by environmental destruction and climate change. Continuing fossil fuel emissions, if unabated, will cause sea level rise and species extinction accelerating out of humanity’s control. Increasing atmospheric water vapor is already magnifying climate extremes, increasing overall precipitation, causing greater floods and stronger storms. Stabilizing climate requires restoring our planet’s energy balance. The physics is straightforward. The effect of increasing carbon dioxide on Earth’s energy imbalance is confirmed by precise measurements of ocean heat gain. The principal implication is defined by the geophysics, by the size of fossil fuel reservoirs. Simply put, there is a limit on how much carbon dioxide we can pour into the atmosphere. We cannot burn all fossil fuels. Specifically, we must (1) phase out coal use rapidly, (2) leave tar sands in the ground, and (3) not go after the last drops of oil. Actions needed so that the world can move on to the clean energies of the future are possible and practical. The actions would restore clean air and water globally, assuring intergenerational equity by preserving creation – the natural world — thus also helping achieve north-south justice. But the needed actions will happen only if the public becomes forcefully involved. Citizens can help by blocking coal plants, tar sands, and mining the last drops of fossil fuels from public and pristine lands and the deep ocean. However, fossil fuel addiction can be solved only when we recognize an economic law as certain as the law of gravity: as long as fossil fuels are the cheapest energy they will be used. Solution therefore requires a rising fee on oil, gas and coal – a carbon fee collected from fossil fuel companies at the domestic mine or port of entry. All funds collected should be distributed to the public on a per capita basis to allow lifestyle adjustments and spur clean energy innovations. As the fee rises, fossil fuels will be phased out, replaced by carbon-free energy and efficiency. Governments today, instead, talk of “cap-and-trade-with-offsets”, a system rigged by big banks and fossil fuel interests. Cap-and-trade invites corruption. Worse, it is ineffectual, assuring continued fossil fuel addiction to the last drop and environmental catastrophe. We need a simple honest flat rising carbon fee across the board. It should be revenue neutral – all funds distributed to the public – “100 percent or fight”. It is the only realistic path to global action. China and India will not accept caps, but they need a carbon fee to spur clean energy and avoid fossil fuel addiction. But our governments have no intention of solving the fossil fuel and climate problem, as is easy to prove: the United States, Canadian and Norwegian governments are going right ahead developing the tar sands, which, if it is not halted, will make it impossible to stabilize climate. Our governments knowingly abdicate responsibility for young people and future generations. I have been disappointed in interactions with more than half a dozen nations. In the end, they offer only soothing words, “goals” for emission reductions at far off dates, while their actual deeds prevent stabilization of climate. The Sophie Prize provides a new opportunity to draw attention to the actions that are needed to stabilize climate. Norway may be the best place, with its history of environmentalism. I can imagine Norway standing tall among nations, taking real action to address climate change, drawing attention to the hypocrisy in the words and pseudo-actions of other nations. So I wrote a letter to the Prime Minister suggesting that the government, as the majority owner of Statoil, should intervene in planned tar sands development. I appreciate the polite response, by letter, from the Deputy Minister of Petroleum and Energy. The government position is that the tar sands investment is “a commercial decision”, that the government should not interfere, and that a “vast majority in the Norwegian parliament” agree that this constitutes “good corporate governance”. The Deputy Minister concluded his letter “I can however assure you that we will continue our offensive stance on climate change issues both at home and abroad”. The Norwegian government’s position is a staggering reaffirmation of the global situation: even the greenest governments find it too inconvenient to address the implication of scientific facts. Perhaps our governments are in the hip pocket of the fossil fuel industry – but that is not for science to say. What I can say from the science is this: the plans that governments, including Norway, are adopting spell disaster for young people and future generations. And we are running out of time. Stabilizing climate is a moral issue, a matter of intergenerational justice. Young people, and older people who support the young and the other species on the planet, must unite in demanding an effective approach that preserves our planet. Because the executive and legislative branches of our governments are turning a deaf ear to the science, the judicial branch may provide the best opportunity for redressing the situation. Our governments have a fiduciary responsibility to protect the rights of young people and future generations. I look forward to working with young people and their supporters in developing the legal case for young people and the planet. To the young people I say: Stand up for your rights, for your future. Demand that the government be honest, admit and face the consequences for you from their policies. To the old people I say: we are not too old to fight. Let us gird up our loins and prepare to fight on the side of young people for protection of the world they will inherit. I look forward to standing with the youth of the world as they demand their proper due and fight for nature and their future. 2010. Obama’s Second Chance on the Predominant Moral Issue of this Century. Op-ed on Huffington Post, Apr. 5. 2010. Only a carbon tax and nuclear power can save us. Op-ed in The Australian , Mar. 11. Canada forcing their way on the pollution deliberation table of the EU with threats based on International Trade regulations. Business does not have a refined nose. Canada Coming With Worse Than Oil. BRUSSELS, Jul 19 (IPS) – Fears of a trade dispute with Canada have made European Union officials reluctant to categorise tar sands from North America as a more polluting fuel than conventional petrol. Officials working for the EU’s executive, the European Commission, are considering the implementation of a fuel quality law nominally designed to make transport cleaner. While the overall goal of the directive has been agreed — that oil companies bring down their emissions of climate changing greenhouse gases by 6 percent between this year and 2020 — its fine print has yet to be hammered out. One of the trickiest issues to emerge in the discussions relates to whether imports of non-conventional sources of oil should be restricted. Hornby’s letter – Ross Hornby, Canada’s ambassador in Brussels – was made available to green campaigners, under the EU’s freedom of information rules. In it, he objected to a proposal that fuels derived from tar sands would be treated differently to those using conventional crude oil. The reporting requirements that this would place on energy firms would be too onerous and would constitute a “barrier” to trade, he warned. Tar sands — a mixture of bitumen, water, sand and clay — lying under the Canadian province of Alberta constitute the world’s second largest proven reserves of oil, outside Saudi Arabia. A study titled Energy Revolution published earlier this month by Greenpeace and the European Renewable Energy Council estimated that producing oil from tar sands would release more than four times more carbon dioxide into the atmosphere than standard oil drilling does today. A senior Brussels official, speaking on condition of anonymity, said that the question of how tar sands should be categorised in the EU “goes further than the quality of oil, it is also a trade question.” The official added that “you can be sure” the matter will be discussed in the context of a nominally separate free trade agreement that the EU and Canada have aimed to conclude by the end of next year. Stuart Trew from the Council of Canadians, a social justice organisation, said a moratorium on the extraction of tar sands is necessary. The eagerness of the Ottawa government to exploit the reserves under Alberta is “a blight on Canada’s reputation and on the world,” he told IPS. Trew expressed particular concern about how a draft version of the trade agreement would — if implemented in its current form — allow corporations to take action against measures that they perceive as hostile to trade. A similar provision in the North America Free Trade Agreement has enabled companies to attack health and environmental measures in the U.S. and Mexico, he added, noting that the procedure lets corporations bypass courts and instead set up private panels. Connie Hedegaard, the EU’s commissioner for climate action, wrote to several green groups Jul. 13 promising that a proposal for regulating tar sands would be put forward after her summer break (most Brussels institutions close during August). Let us remember – when the US decided to make the introduction of unleaded gasoline mandatory and this decreased the market for tetra-ethyl-lead, the company that made the product started to ship out Canada made ingredients to the US forcing their way via International Trade regulations. This was a real headache of penalties for the State of California – or call it trade extortionism?